I watched it devour a whole nest of tent caterpillars. Yellow-billed Cuckoos, we need a lot more of them – they prefer to eat hairy caterpillars like the eastern tent caterpillar that defoliate trees. The Yellow-billed Cuckoo, Coccyzus americanus, sometimes called the rain crow, nests and forages in the riparian forests along our part of the Middle River. 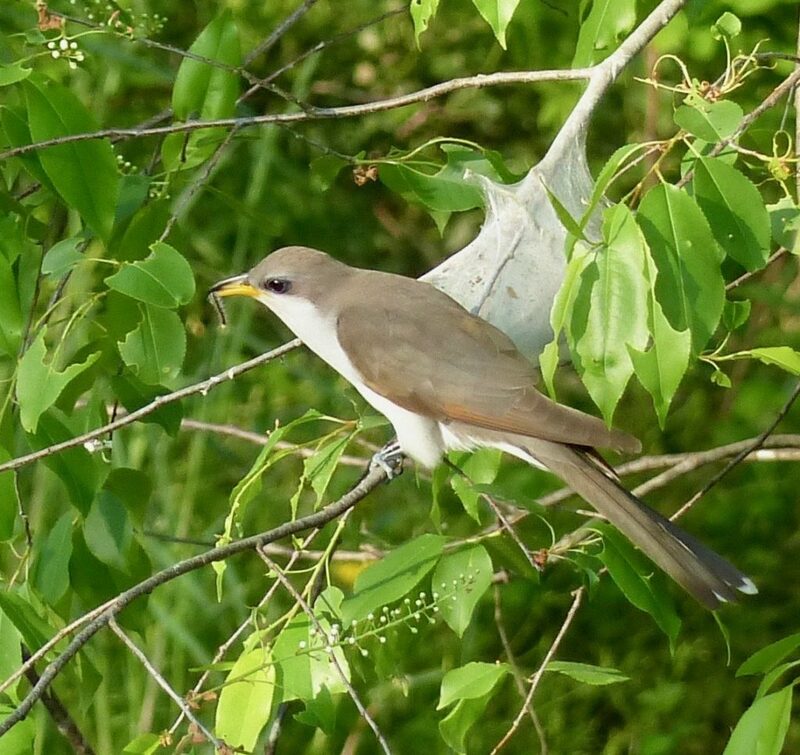 Yellow-billed Cuckoo eating tent caterpillars in a wild-cherry tree in our river field in Swoope, VA. Photo by R. Whitescarver. Not many birds eat hairy caterpillars. Yellow-billed Cuckoos prefer them. The eastern tent caterpillar, native to North America is hairy and prefers to lay eggs and build silken nests in native, black cherry trees. 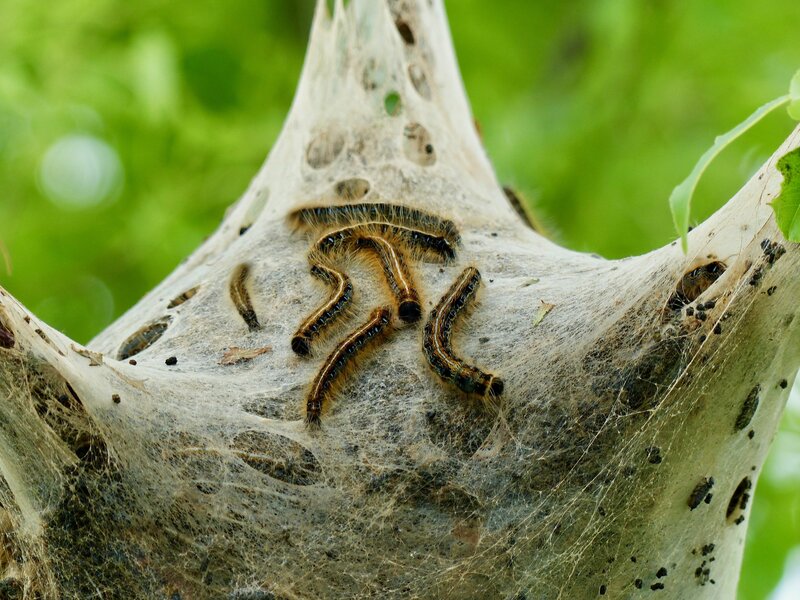 During the heat of the day, the caterpillars hide and rest within their silken nest. At night or early morning when it is cool, they come out and consume the host tree’s leaves, often defoliating the entire tree. Cuckoos swoop in during the day, rip the nest open and devour the resting caterpillars. Yellow-billed Cuckoos are about the size of a Blue Jay with a long, banded tail. They are difficult to see because they remain so still for long periods of time. They have a distinct call, however; that is unmistakable – kuk, kuk, kuk, kuk, keow. Watch and hear Yellow-billed Cuckoos during their mating ritual of holding a small stick together. Video provided by FeatherFlix bird ID app and Micheal Godfrey, my neighbor in Swoope. These beautiful birds were not on this farm fifteen years ago because there weren’t enough trees along the river to attract them. In 2004 we fenced the cows out of the river and planted native trees along the banks creating a riparian forest. Today many of our trees are over fifteen feet tall and are host to not only the Yellow-billed Cuckoo but other riparian forest birds such as the Willow Flycatcher, Yellow Warbler, Warbling Vireo and both Baltimore and Orchard Orioles. Non-breeding Yellow-billed Cuckoos do not migrate. Breeding birds; however, migrate from South America to North America to breed and raise their young. Migrating birds travel north through Mexico and when they arrive at the Southern tip of the Rocky Mountains they split into two “Distinct Population Segments” – the Western Segment and the Eastern Segment. Range map of the Yellow-billed Cuckoo. The Western Distinct Population Segment was listed as “Threatened” under the Endangered Species Act by the US Fish and Wildlife Service on October 3, 2014. The reason for the drastic population collapse in the West is the destruction of riparian forests for agriculture and urban development. Scientists believe their populations have been extirpated or wiped out completely from British Columbia, Washington, Oregon, and Nevada. 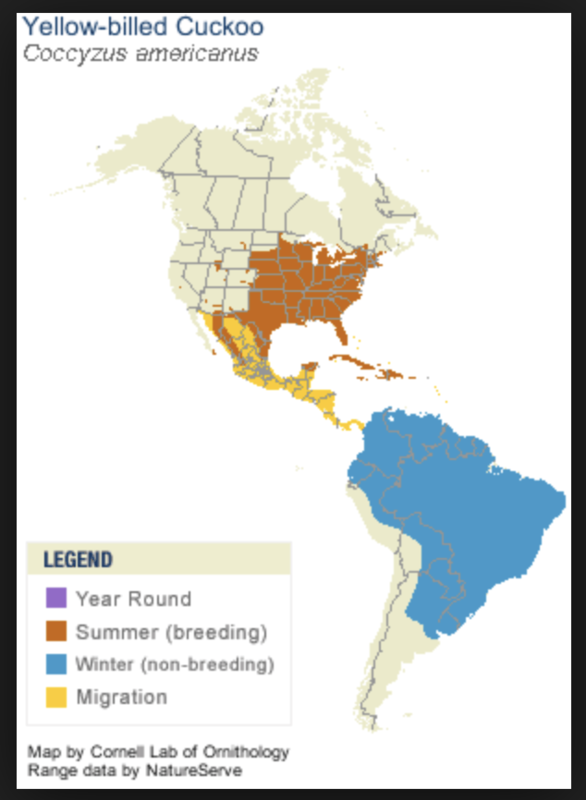 Here in the East and in the Chesapeake Bay watershed, the population of Yellow-billed Cuckoos is considered common but in steep decline, losing fifty-two percent of its numbers in the past forty years, according to Partners in Flight, a conservation organization with over one-hundred and fifty partner organizations throughout the Western Hemisphere. There are many benefits of a riparian forest. Increased wildlife diversity is only one. Improving water quality in a stream is another. Native trees along a stream provide leaves for the aquatic bugs to eat. Leaves are the corn silage of the aquatic ecosystem. A thriving, healthy aquatic ecosystem is two to eight times more capable of processing in-stream pollution than a non-forested riparian buffer, according to the Stroud Water Research Center. 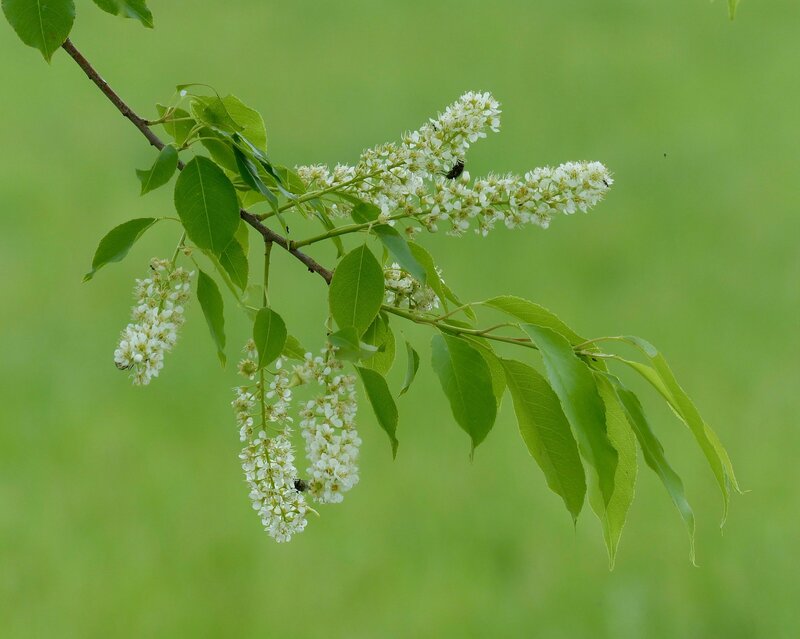 Wild cherry or black cherry is a native tree of the Eastern US. It is one of our most important wildlife trees providing nectar, fruit, and shelter for many species. It is also prized for its wood to build furniture. The eastern tent caterpillar prefers this tree to lay their eggs. Wildlife will come and our streams will become cleaner when we plant more riparian forests. It’s one of the most important and cost-effective practices we have to restore the waters of not only the Chesapeake Bay but the waters of the world. We enrolled in USDA’s Conservation Reserve Program in 2004 but there are many programs that can assist with establishing stream-side forests. To find out more, contact me, your local USDA, or Soil and Water Conservation District office. In the West it’s the wet canyons that are the arteries of life; in the East we have the sycamores, skeletal stream-side sentinels. Thanks, Bobby, for your work in making us aware of our opportunity to enrich the Shenandoah Valley with forested stream-side corridors. Thank you, Michael, for your comment and for the video. You are welcome, Rich. Thanks for stopping in. Bobby – thanks for a fascinating bit of nature lore. The linked video is a nice addition. I’ll watch and listen for cuckoos near my caterpillar-ridden cherries. David, thanks for your comment. I hope you get some Cuckoos! Cindy, thank you so much for your comment. I’m glad for your trees!